Schematic of potential Ca2+ sources that might be specialized to regulate reactive signaling pathways in cardiac myocytes. (i) Some L-type Ca2+ channels (ICa,L) are not associated with the junctional complex and hence could be involved in providing a local Ca2+ signal in specific membrane-associated compartments. 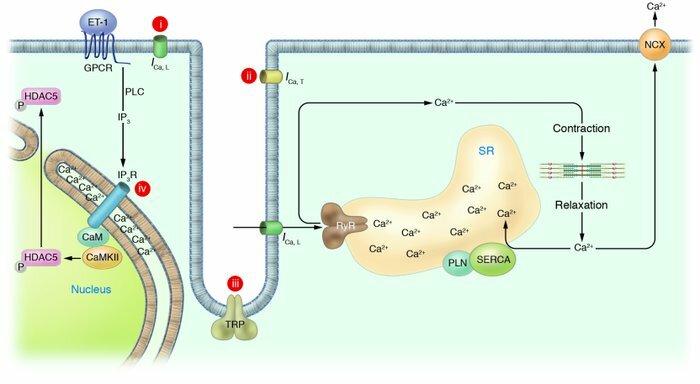 (ii) T-type Ca2+ channels (ICa,T) are reexpressed in hypertrophic states where they could provide Ca2+ in specific microenvironments associated with the sarcolemma to affect reactive signaling pathways. (iii) Capacitative or store-operated Ca2+ entry through transient receptor potential (TRP) channels, alone or in conjunction with (iv) InsP3R-mediated release of Ca2+ from the ER/nuclear envelope, could also provide a highly localized Ca2+ pool for controlling reactive signaling pathways in cardiac myocytes. Signaling from G protein–coupled receptors (GPCRs) activates PLC and generates InsP3, causing a perinuclear Ca2+ signal through the InsP3R, resulting in CamKII activation and HDAC5 nuclear export, as proposed by Wu et al. (2). IP3, InsP3; IP3R, InsP3R; PLN, phospholamban; NCX, Na+/Ca2+ exchanger; RyR, ryanodine receptor; CaM, calmodulin; SERCA, SR/ER Ca2+-ATPase; P, phosphate.